I made this Curious George Birthday Cake for my partner’s nephew for his birthday present. He loves monkeys and seeing as George is his fav I thought it was the best one to do. I made it using a Madeira sponge which took 10 eggs, only just had a bowl big enough. I used an 11inch flower shaped tin and then placed on top a dinner plate and cut round it to get a huge round cake. I buttercreamed and jammed the inside and then crumb covered the outside with more butter cream. The icing I used was ready coloured icing. 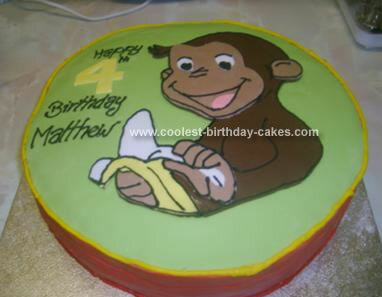 The actual Curious George was made by printing off a picture and then cutting that out so I had the template to place on top of chocolate flavoured icing and then gradually cut off parts from the picture to use same way on different coloured icings. Finally I piped on a yellow round the top and red round the bottom just to hide any mistakes. It went down a storm. Birthday cake idea Posted by Laura T.